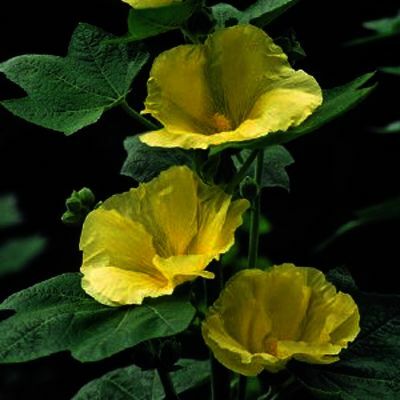 'Little Moonshine' Bright, golden-yellow flower clusters. Similar to 'Moonshine' but more compact. 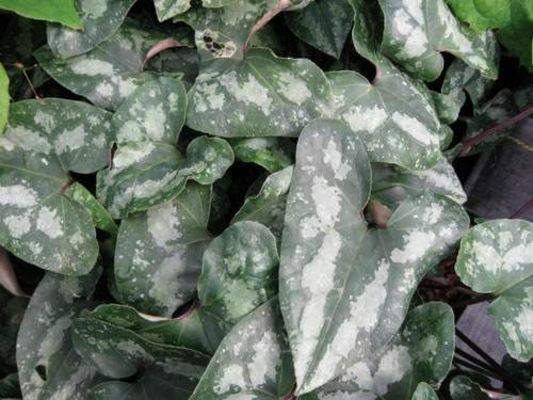 Gray-green foliage and very early-blooming. H 12-14"
NEW! 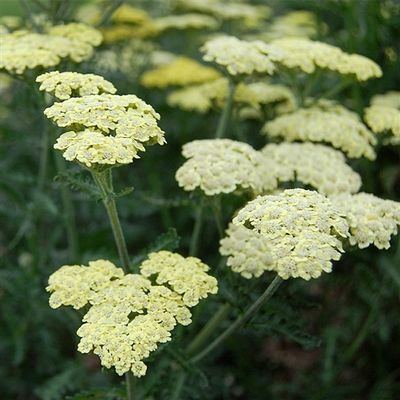 'Sassy Summer Lemon' Not only will you love the huge flower heads of bright, sunny yellow blooms and silvery foliage, but you'll be equally delighted by its earlier bloom time. 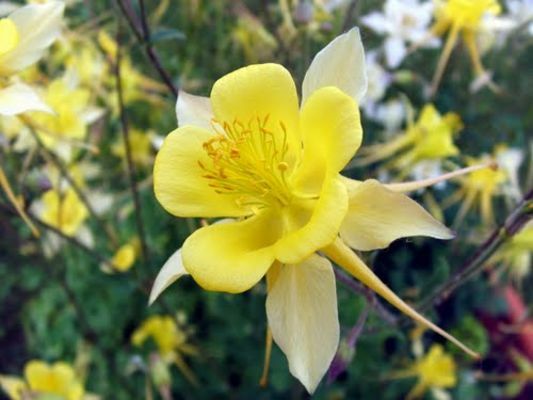 H 28-32"
x 'Moon Dust' This sport of 'Moonshine' is about half the size with the same silvery foliage and lighter yellow flowers. H 12-14". AJUGA reptans 'Black Scallop' (Bugleweed) Black foliage and spiky blue flowers, which appear in early summer make a dramatic contrast. 'Black Scallop' thrives in full sun, which intensifies the black color. An effective, rapid growing ground cover. Very versatile, growing in full sun or full shade. H 3-6", May-June. Zone 4-8. 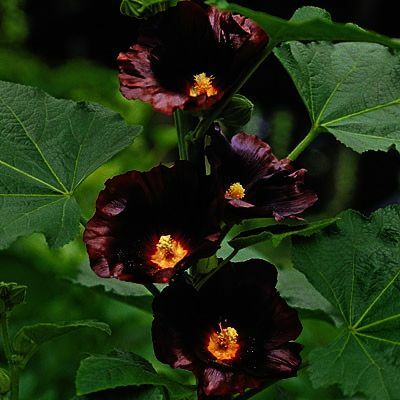 'Black Night' An unusual shade of purple-black with a yellow eye. 'Mars Magic' Shades of bright red. 'Radiant Rose' Rose-pink single flowers. 'Sunshine' Shades of bright yellow. ALLIUM A large and varied genus, including chives and ornamental onions. 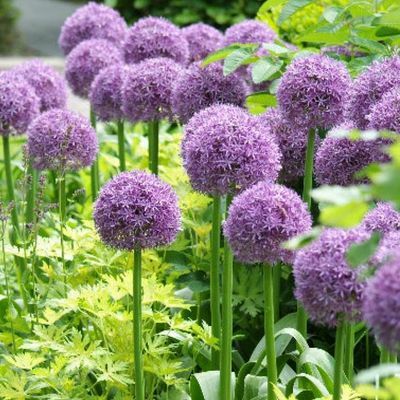 Alliums are useful as contrast plants, cut flowers, culinary herbs and insect deterrents. Prefer full sun, tolerate dry soil. 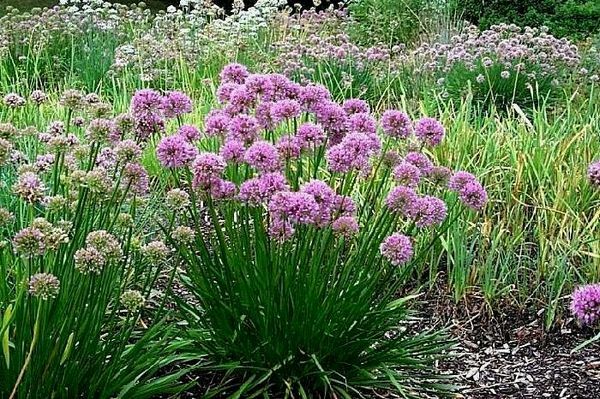 schubertii Commonly called tumbleweed onion, this is a bulbous perennial grown for its impressive display of rose-purple flowers that bloom in giant, spherical umbels (each to 9-12" in diameter) in late spring. H 12-24", Zone 5-8.
x. 'Medusa' Twisted foliage and stalks with Grey-green, narrow foliage. 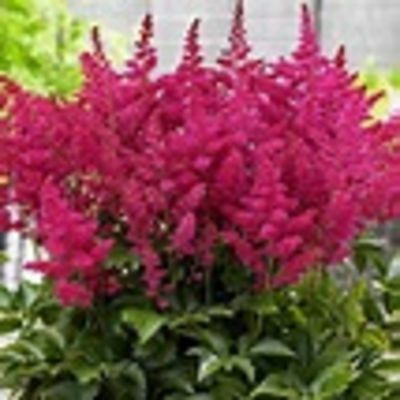 Month-long color show of 2" purple ball like flower clusters Deer and rabbit resistant. H 20-24", Zone 4-8.
x. 'Millenium' 2018 PERENNIAL OF THE YEAR! 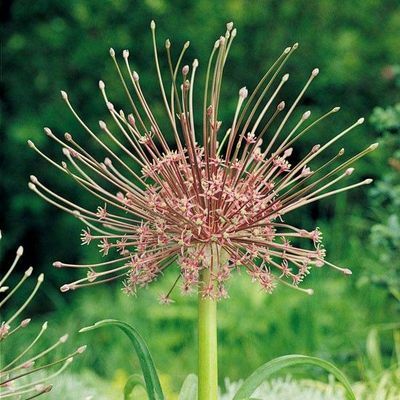 This hybrid allium blooms in mid-summer with large 2" globes of rose-pink flowers. 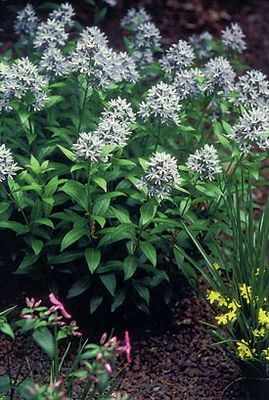 Mature plants have dozens of globes covering the attractive, shiny deep-green grassy foliage. H 12-18", Zone 5-8. 'Storm Cloud' Dark black stems and dark leaves with silver veins as plant emerges. 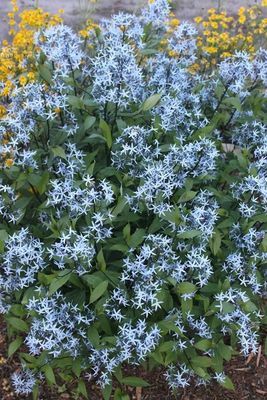 Long blooming light, periwinkle blue, star-shaped flowers. 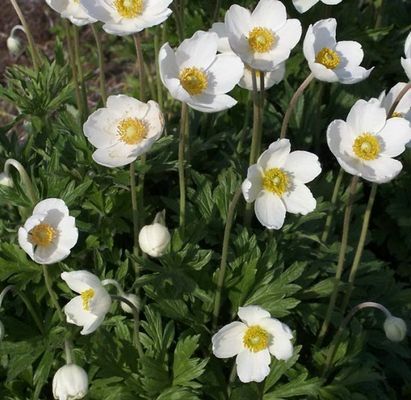 H 24-30"
ANEMONE (Windflower) A large genus consisting of the Fall blooming Japanese Anemones and the Spring bloomers that are native to North America. All have mounds of lovely foliage. All prefer rich, moist, well-drained soil in full sun to part shade. Most prefer to be shaded from the midday sun. 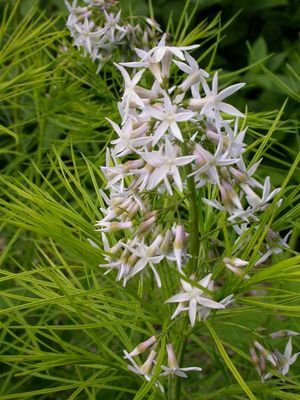 Zone 5-8.
sylvestris (Snowdrop) Large pure white fragrant flowers are held well above lush foliage in spring. Nice when paired with bulbs. Flowers fade to form attractive cottony seed heads. Spring bloomer. 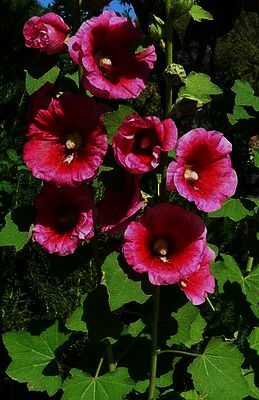 H 12-15"
tomentosa 'Robustissima' Single mauve-pink flowers. July-August, H 3'. NEW! x. 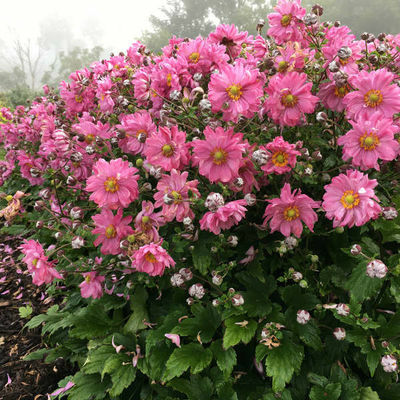 'Fall in Love Sweetly' When other plants in your garden are fading, FALL IN LOVE™ 'Sweetly' is just getting started, producing rich, semi-double, rose pink flowers. H 20-26"
x. 'Fantasy Pocahontas' This beautiful, compact gem is a "must see for yourself". 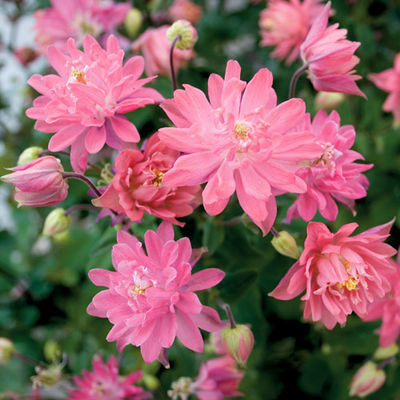 Produces double pink blooms from July to September that are on sturdy stems. H 12-18". x. 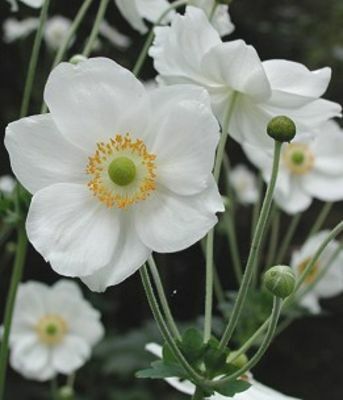 'Honorine Jobert' Single white flowers on long, sturdy stems. Late summer. H 3'. x. 'Wild Swan' Multi-award winning, the elegant 3” snow-white flowers are accented with a lilac blue wash on the reverse and flowers are produced from June to November. H 18". 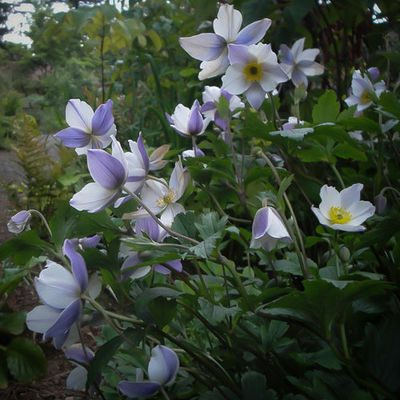 ANEMONOPSIS macrophylla A rarely offered wood-lander from Japan with delicate looking sprays of waxy, lilac flowers among deeply lobed dark green leaves. Hardy and long lived. Full to part shade and moist, rich soil. Late summer. H 2-3', Zone 4-7. ANGELICA gigas This is a unique, bold-leaved plant, excellent for specimen effect. 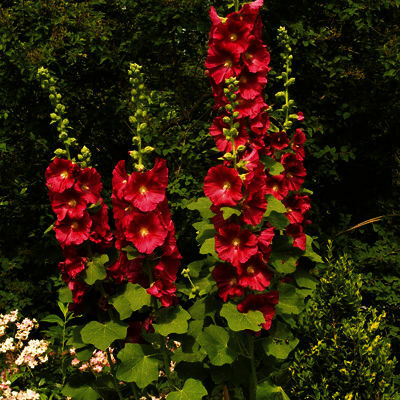 A bushy, upright clump of coarse green leaves, bearing huge umbrella-like heads of crimson-red flowers in late summer. A self-seeding biennial. This is NOT the species of Angelica used for its edible stems. Partial sun, H 3-6', Zone 4-9. 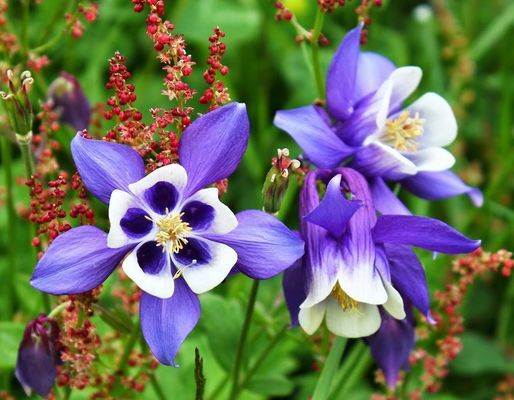 AQUILEGIA (Columbine) Columbines are delicate, clump-forming plants which bloom in early summer and are charming in bouquets. All have beautiful foliage and uniquely shaped blooms. 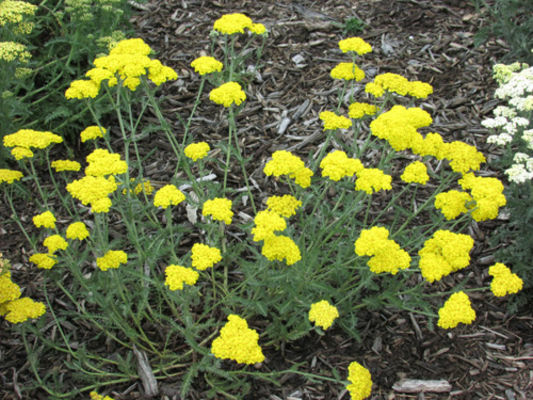 They thrive in sun or partial shade and a well-drained soil. Some reseed easily. Zone 3-8. NEW! caerulea 'Kirigami Pink' Bold, vibrant color of rose with pink corollas and upward facing flowers. H 14-24"
canadensis Nodding, spurred flowers. Early spring bloom. Red spurs around a rosette of yellow sepals. 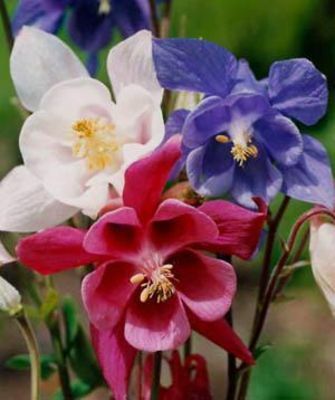 Our native columbine. April-June, H 1-2'. NEW! 'Little Lantern' A dwarf selection of columbine native to the Eastern US. The nodding bright red and yellow flowers appear in late spring. H 10-12", Zone 3-8.
songbird series Eye Catching! 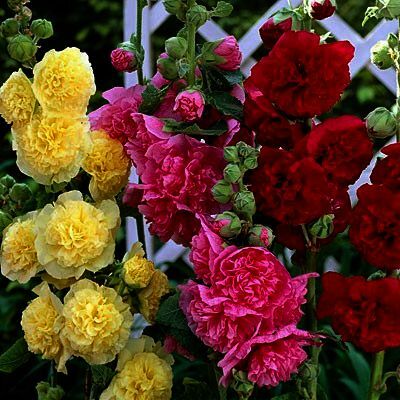 An abundance of deep-colored flowers that are long lasting. 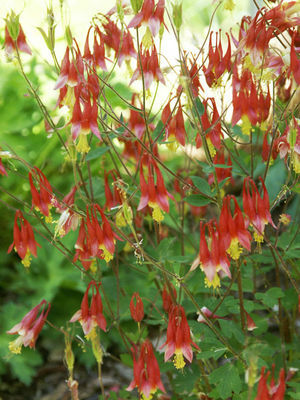 3 1/2" blossoms face skyward rather than nodding as with other columbines. Available as 'Goldfinch', clear yellow. And new for 2019 'Blue Jay', an intense shade of blue with white centers. H 18-24". NEW! spring magic series The different flowers of this series feature bold hues of blue, pink, yellow and white, all accented with white. H 12-16". 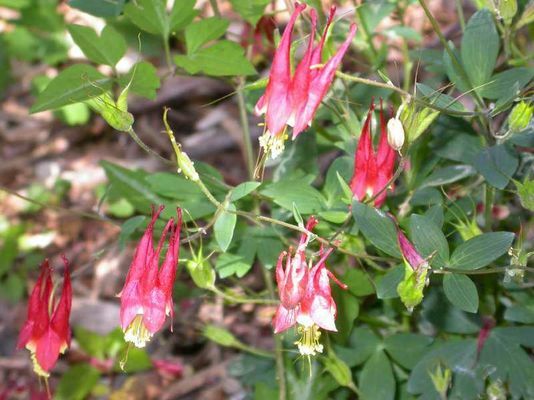 vulgaris Double, short spurred flowers blooming earlier than other Columbines. Early May to Mid-June. 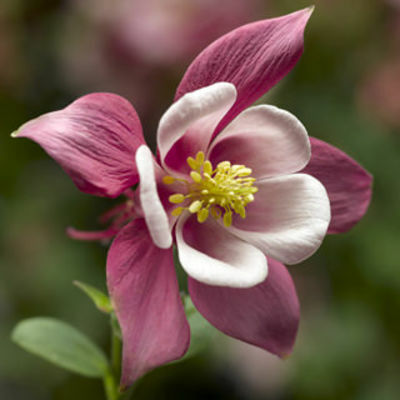 'Clementine Salmon-Rose' (Double Columbine) Fluffy double flowers that resemble small Clematis bloom; this selection produces blooms in shades of dusty rose to salmon with a yellow center. H 12-18". 'Grandmothers Garden' A well-loved vintage cultivar. The flowers have short, incurved spurs which end in small knobs. 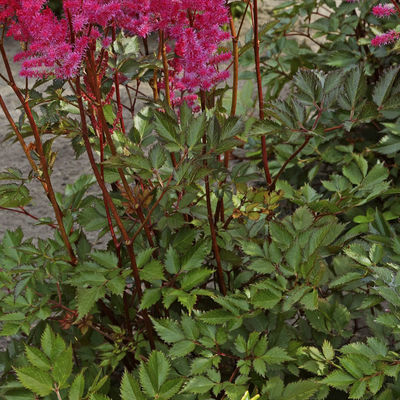 The plants will bloom in rich shades of either rose, violet, or wine red. May reseed freely, perhaps cross pollinating with other varieties. 24-30"
ARALIA cordata 'Sun King' (Golden Japanese Spikenard) This tropical looking beauty brightens up the shade garden with its very large, bright gold leaves. With a few hours of sun, the foliage remains bright gold through the summer, the clumps are topped with 2' tall spikes of tiny white flowers which give way to purple-black berries in fall. 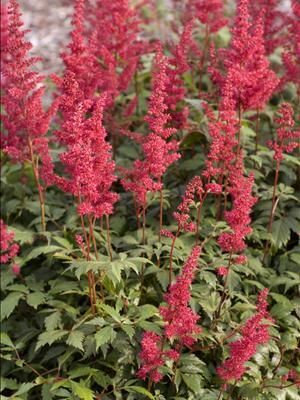 3', blooms mid-late summer, partial shade in average soil. 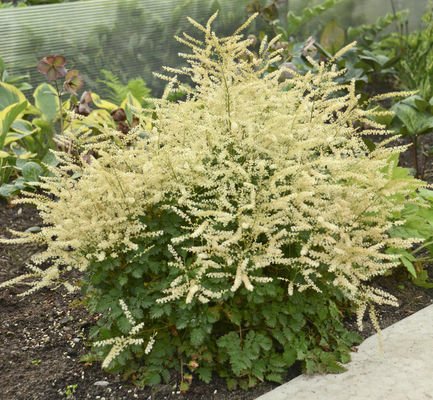 Zone 3-9.
aethusifolius A ground-hugging mound of finely cut foliage which sports creamy white plumes in summer. 8-12"
dioicus 'Whirlwind' This hybrid produces consistent, finely dissected, cut foliage, which is a little wider than 'Kneiffii'. 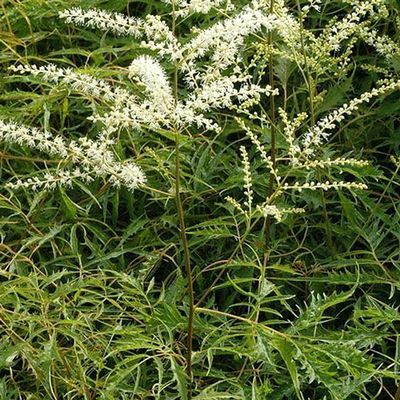 Highlighted May thru July with creamy white feathery panicles. Sturdy upright growth habit. 2'; in bloom 4'. x. 'Chantilly Lace' Flower power! 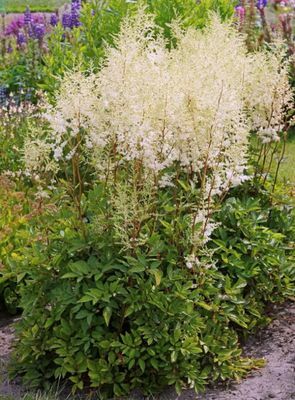 'Chantilly Lace' forms a mound of dissected foliage that is crowned in early summer with billowing sprays of creamy-white flowers that nearly hide the leaves! H 30-32". 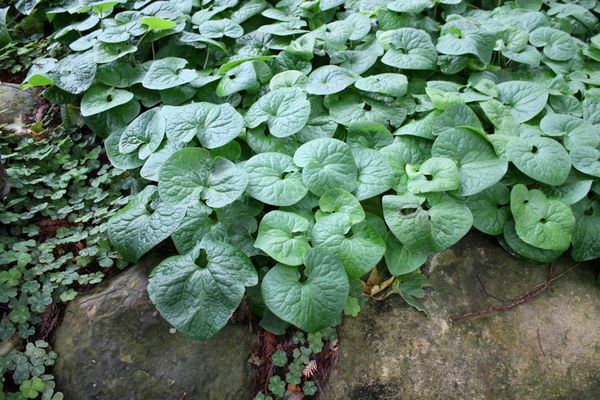 ASARUM (Wild Ginger) An wonderful genus, excellent as a woodland ground cover. 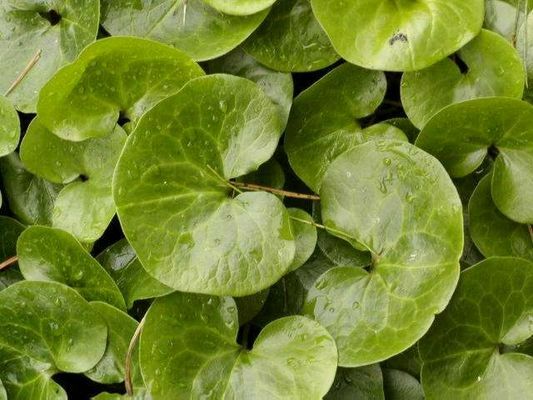 Glossy heart-shaped leaves of deep green. Once established it is very drought tolerant. Full/partial shade, humus-rich moist soil. 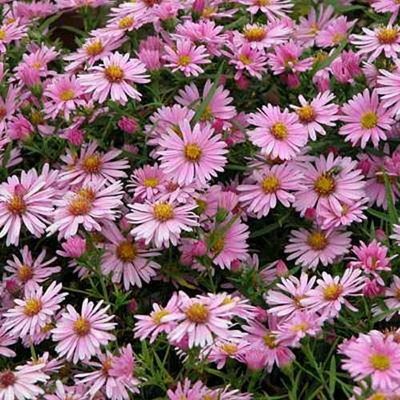 ASTER Large genus of perennials with a variety of heights, all with daisy-like blooms. Great for attracting butterflies. 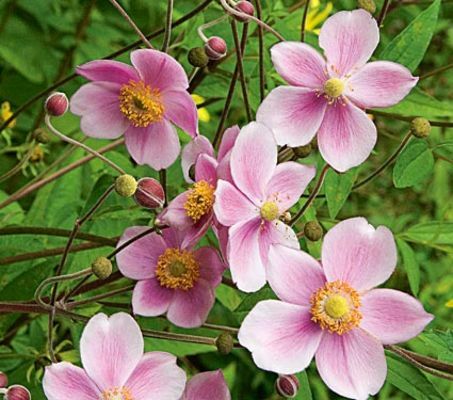 Grow in sun or part shade in a well-drained soil. 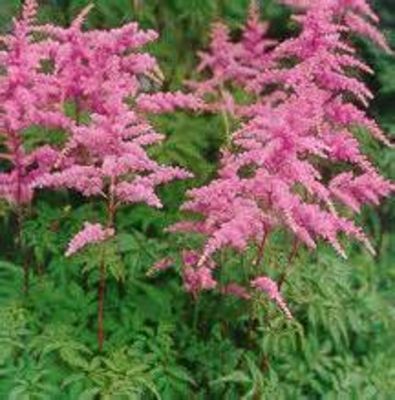 Zone 4-8.
dumosus 'Woods Pink' Dwarf hybrid with superior disease resistance. 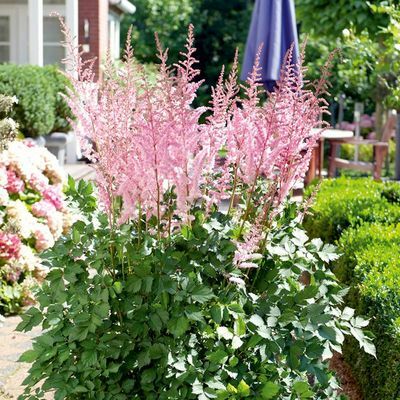 Prolific pink flowers that bloom for a long time in late summer and early fall. H 10-16". 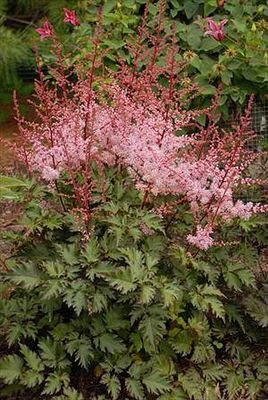 ASTILBE (Plume Flower) Very hardy, showy, plume-like flowers on attractive, often glossy foliage. 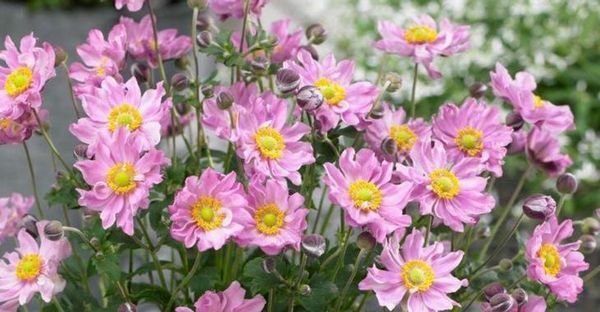 They love rich, deep, moist soil in partial shade, but will grow in sunny sites where the soil really holds moisture or has irrigation. Rabbit and deer resistant. arendsii A cultivar group of complex hybrids with A. astilboides, chinensis, japonica, thunbergii and others. Zone 4-8. 'Bridal Veil' Feathery white plumes, late June-July, H 18". 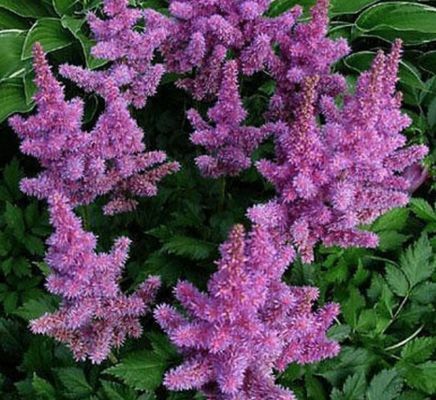 'Chocolate Shogun' Incredible dark glossy, chocolate-purple lacy foliage is the deepest darkest foliage color by far in an Astilbe. 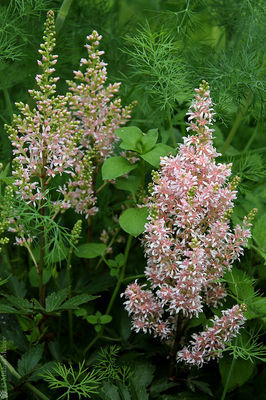 Blooms of soft pink appear in late summer to about 2 feet tall. 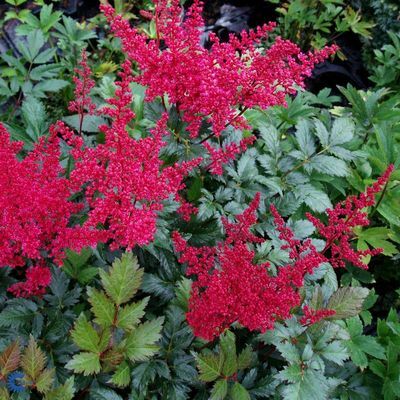 'Fanal' Large plumes of tiny red flowers in midsummer, accented by deep green to bronze-green foliage. H 18-24". NEW! 'Look At Me' A Dwarf Habit! Sweet bubblegum pink flowers on shocking red stems. Very compact. Flowers early to mid-summer. 15-17", Zone 3-9. 'Little Vision in Purple' A new dwarf form of the Vision series. This is a robust variety that tolerates sun better than others. 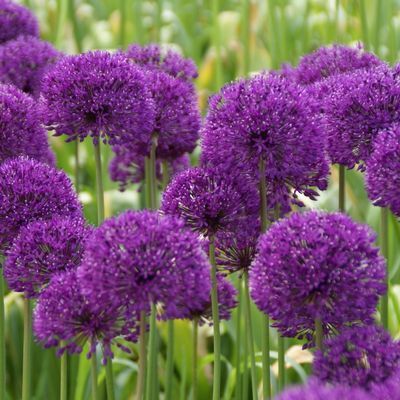 Offered in 'Purple', with blue-violet to purple blooms. Mid to late summer, 14-16"
NEW! 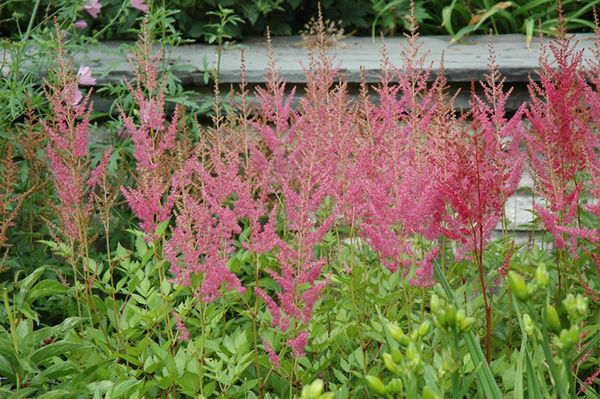 'Lowlands Ruby Red' Dense plume-like panicles of deep red. Blooms mid-season. H 20-24"
'Mighty Chocolate Cherry' Robust, strong velvety-red flower spikes, divided dark green and chocolate brown to reddish foliage. H 45"
'Mighty Pip' Strong, robust spikes of graceful extremely large salmon-pink plumes. Late season. 45"
NEW! 'Mighty Plonie' Tall floriferous variety. 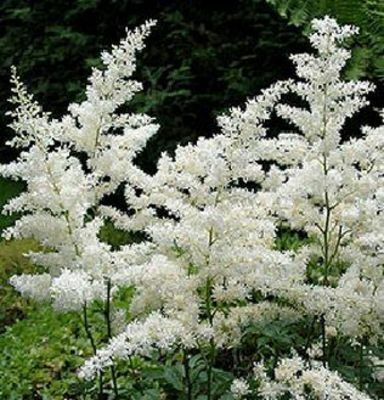 Pure white plumes and clear green foliage. Blooms mid-season. 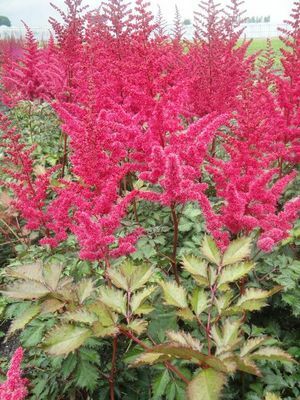 H 38"
'Mighty Red Quin' Huge Astilbe with 4' towering red flower plumes. Foliage starts red, brown to then turn green. Robust grower. Blooms summer/late summer. H 48-50"
'Milk and Honey' Creamy white plumes turning to a light pink as it ages; lacy green leaves. Mid-Late Summer. 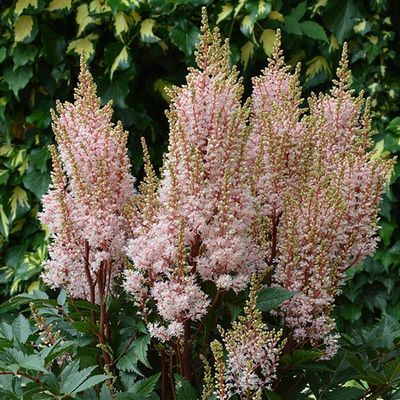 24-30"
'Vision in Pink' A robust grower with thick pale-pink plumes and blue-green foliage. July. 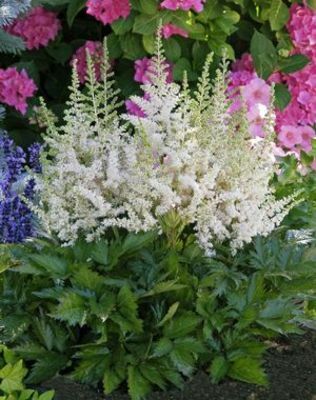 32"
'Vision in White' This variety has large, creamy white, triangular flower plumes that stand above a robust clump of smooth, glossy, green leaves. More refined foliage than a typical chinensis type. Mid-July thru August. H 24", Zone 3-8.
japonica Large airy flower clusters that are not as dense but make up for it in volume. Bright colors and glossy leaves. Zone 4-8. 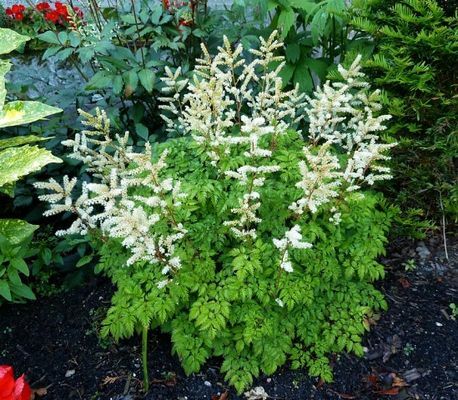 'Deutschland' Shorter and earlier than other whites, this Astilbe will bloom in early summer, with pristine white plumes. H 18-24"
'Montgomery' Handsome, fern-like glossy green foliage and stiff stems that hold elegant true red plumes aloft without staking. June-July. 24"
x. 'Radius' Shiny red, elegant, spiky plumes stand tall in a vase-like shape over dark green foliage. Mid-summer. H 24". x. younique series This series offers a more compact, rounded habit with very vibrant color. These plants produce double the amount of dense flower scapes. Offered in 'Salmon', 'Ruby-red' and 'White'. H 12-18".